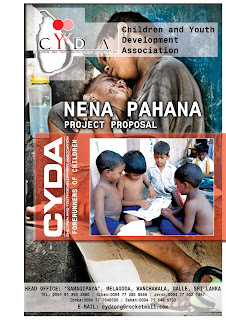 The Children and Youth Development Association (CYDA) was begun as a result of the community services carried out in 2004 at the devastation caused by the Asian Tsunami. At present our organization is conducting various programmes targeting children and youth in the Sri Lanka (Mainly we activating Galle districts and Matara districts) We wish to expand our services firstly in the Southern province and eventually in other districts in Sri Lanka. Accordingly we have planned ten events for a period of five years. However, inadequate funds prevent us from us from moving on with these plans. Therefore, we would appreciate it if your organization Civil Society Fund in Sri Lanka would motivate us youth by supplying us with the necessary funds. "Make A Difference Today,Because Children and Youth Can't Wait...."
Yes, We want to help make a difference by supporting all the work that Protect the Children and Youth being done to help both in need in the Sri Lanka. Donors who wish to help us to carry out our Future projects please contact us via our email. There are many talented and skilful children in the rural level. They are unable to brush up their talents and make it a point to enlighten their lives. (For the differentially abled (disabled) children) Through the project “Heta Puudina mall” we focus on children who are born with physical & mental disabilities. From the problems we identified, the problems we gave priority was developing non school attending children and street children. The project should be aimed at the school children and school leavers. This is what we feel. We have named the project as "Udaya Shakthi" with the hope of getting the strength of the youth of the North and South. 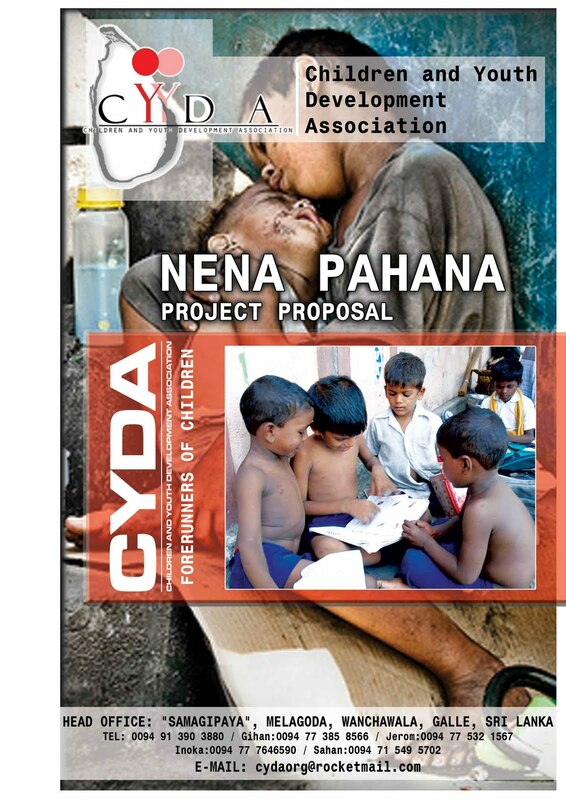 The Children and Youth Development Organization (CYDA), targeting groups of children and youth is active in the Galle and Matara districts in Sri Lanka. We have conducted various programmes for children and youth in these areas. We would like to kindly request for any free publications suitable for these groups. Your generosity would be much appreciated. The Children and Youth Development Association has been formed to uplift the standard of children and youth covering the Southern Province with Galle district and Matara district as the centers. This association commenced with the commuíl efforts of youth in the Galle district at the 2004 Tsunami coatastrophe. As youngsters we have practically experienced the problems of school going and non attending children. Consequently it has paved the way to the formation of a progressing organization. Now we have a dedicated board of directors to fulfill the aims of our association. The cooperation of donors is thus anticipated as we do not have sufficient monetary and infrastructure facilities. Although the above association was resumed recently, child and youth societies have been established long time back. Programs such as Leadership Training, Conservation of Children’s Rights, Seminars and Prevention of Usage of Drugs have been planned by our association. After the Tsunami disaster we held Community Development Programmes, Children's Mentality Conservation and Cultural Shows. The members of the above Board who had been to different countries in order to attend the South Asian Youth Conference, mass media communication diploma holders and undergraduates. There is a young lawyer too in the board of directors. There are also member who have had a long standing service island wide in different Non Government Organizations. There are also members who follow Training courses held by the Canadian Universities on courses like Positive Thinking, Leadership Training, First Aid and Life Development. Certain members are still occupied in Tsunami Relief Programmes, housing constructions for Tsunami victims and other constructional activities. Our organization represents the National Youth Service Council and also Government all Organizations. 1. To create Prevention of Drug Use Societies to relevant to school and villages. 2. To produce officials as Emergency Relief service members. 3. To form Environment Societies and Conservation of the Environment. 4. To motivate children of school going ages to attend schools. 5. To provide assistance to children attending religious schools and also to children lacking school facilities. 9. To secure the Rights of children. who are a threat to the society. 12. To be able to organize medical clinics for villages and partly urban areas. 13. To organize Montessori education and assist children who are downtrodden. At present, there are about 18 children and youth circles. In future, it will be broadened as follows. In the first 6 months there will be 30 social clubs in the Galle district. Our expectation is to form 10 children's societies in the Hambantota district. Annually these children's clubs will be transformed into Youth Clubs. Each of the children's club will be provided with 2 leaders. Finally, they will have the opportunity to become members of the Board of Directors. For all these projects, we expect financial support and infrastructure from generous donors. The second generation belongs to the inheritance of the future of the country. Our aim is to produce a building generation with good personalities and free mentality who are respectful and social citizens of the country. Our supreme Philosophy is to create a second generation possessing argumentative and creative abilities and to build a fruitful society. 1. Producing citizens who avoid intoxicants associated to village and school background. 2. Providing counseling to school children with regard to their respective family background in solving the liquor consumption problems. 3. Producing emergency disaster and relief service groups. 4. Conserving environment and producing environmental society. 5. Directing students to attend schools during the school going age. 6. Helping students with less facility for their education and assisting the school education. 7. Developing the sports skills of children in the respective villages. 8. Providing assistance in the field of sports and library facilities for the children. 9. Helping to uplift the creative ability of the children. 10. Supplying community service and volunteer service for the villages. 11. Conservation of children's rights. Organization. Picture Window theme. Powered by Blogger.